More Vegan Thanksgiving choices in Charlotte, NC – Whole Foods! This year, Whole Foods is offering a Vegan Dinner for One. It includes Gardein Holiday Roast, Sweet Potatoes, Green Beans Almondine, Sourdough Sage Dressing, Mushroom Gravy, and Cranberry Orange Relish. Very reasonably priced at $12.95. I both love and hate this idea. 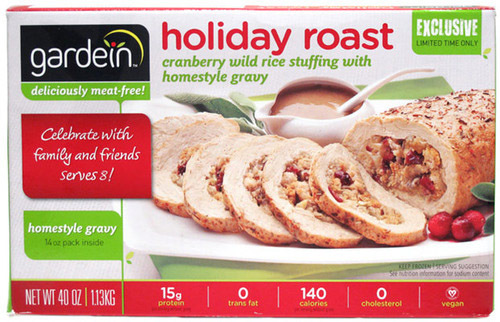 On the one hand, it’s perfect for those who are the only vegan in the family, and the rest of the family is INSISTING on turkey! The vegan can buy a dinner just for himself/herself and let the rest of the family cook/eat what they want. It’s also a wonderful idea for those omnivores throwing a huge Thanksgiving dinner with that one weird, picky, vegan dinner guest who got so upset last year when they were served a plate of salad. “But what else do vegans eat beside salad?” the omnivore chef wonders. “What else can I fix for them?” With Whole Foods Vegan Dinner for One, the problem is neatly solved! So why do I also hate this idea? Because … it’s a vegan dinner for one. Why doesn’t Whole Foods offer a vegan dinner for two? Or a vegan dinner for four? (Whole Foods turkey dinners are sized for 4 to 12 people.) Sometimes, there is more than one lone vegan at a holiday gathering. What about those of us who also have vegan spouses or partners? Maybe, even, whole vegan families? Vegan friends? Or people like me, who do not allow meat in the house for humans, even if guests are omnivores? I checked to see if items could be ordered a la carte, and, confusingly, found that online items were not clearly marked vegan or vegetarian. So I contacted the lovely Shannon Bourret at Whole Foods and she checked the ingredients lists of all the foods they have available for Holiday ordering. These are the foods that are vegan: cranberry orange relish, cranberry apple conserve, HSH cranberry date compote, sourdough sage stuffing (made with vegetable stock and vegan margarine), HSH sprouted grain stuffing, chipotle roasted sweet potatoes with red onion marmalade, HSH roasted vegetable gravy, fruit platter, vegetable platter, Gardein holiday roast, vegan sweet potatoes, green beans almondine, vegan mushroom gravy, apple agave pie, berry explosion pie, cherry pie, and ginger yams. There were also a few other items she believed to be vegan, but as she couldn’t find the ingredients list for them she left them off the list – better to err on the side of caution! Ordering is easy – order online or just stop by the store! 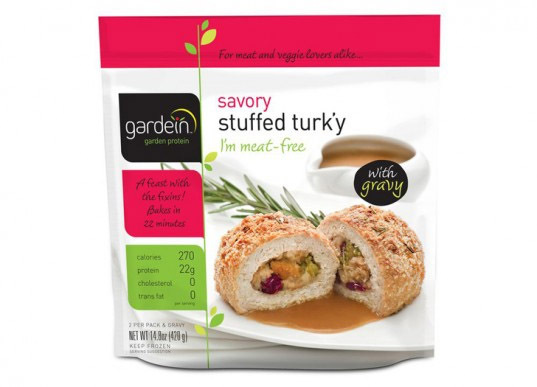 I also want to note that Whole Foods is the only store I’ve found in the area that carries Gardein’s holiday products – Savory Stuffed Turkey and Holiday Roast. And if you’re looking for a stuffing mix, Whole Foods offers their own 365 brand of vegan stuffing. One last thing – Shannon runs the vegan-friendly “Health Starts Here” events at Whole Foods. While some events are geared more towards new vegans or those considering becoming vegan (viewings of “Forks over Knives”), there are other events longer-term vegans can enjoy, such as book club discussions, store tours, and yoga. Check it out online or through the “Health Starts Here” meetup group. I had the same feeling as you, ‘love and hate’. It is so hard for only one in my husband’s family is vegan. In all the family gathering during the year, I need to bring my own food along, sometimes I felt deeply hurt, can you understand? But my own family (maiden’s family) are all vegan or vegetarian, I love to have gathering with them, because I have no problem to eat, but they are far with me now ( in Hong Kong). I think you can get what I meant. I’m so sorry you have to bring your own food to those gatherings! I don’t blame you for feeling hurt. I was actually the vegan at a Thanksgiving dinner once who was served the plate of salad. It’s not fun, is it? Do you have any vegan friends you can get together with before or after the holidays for a vegan dinner or potluck? My vegan friends all in Hong Kong, we had been an unforgetful holiday in Taiwan when I went back with them. Vegan or vegetarian in Taiwan are so popular and convenience. I just love reading about all the veggie choices in other countries! Where I live our ethnic restaurants have mostly been “Americanized” with plenty of meat … and then I read all these yummy recipes on blogs like yours! I really thank you for sharing all your delicious and authentic recipes! Charlotte, thanks you like it. I will take more unusual vegetables and make up more interesting recipe later if I can find it in England. But I can tell you that, there are more choices in around Asia.